Lice have been associated with people throughout written history. Outbreaks often occur with disasters or crowded and/or unsanitary conditions when people cannot bathe or wash their clothing regularly. However, lice may become a problem in seemingly sanitary environments. As with pests such as bed bugs, human lice are not limited to any particular socio-economic level in our communities, but people with limited financial resources often lack the ability to cope with severe problems Each year in North Carolina, county health departments diagnose several hundred cases of human lice ("pediculosis"), primarily head lice. This estimate probably represents only the "tip of the iceberg," since many cases likely go unreported because people consult their private physician for treatment. 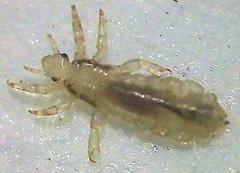 Lice are small (<1⁄16 inch long) wingless insects with flattened, elongate bodies and somewhat oval heads. 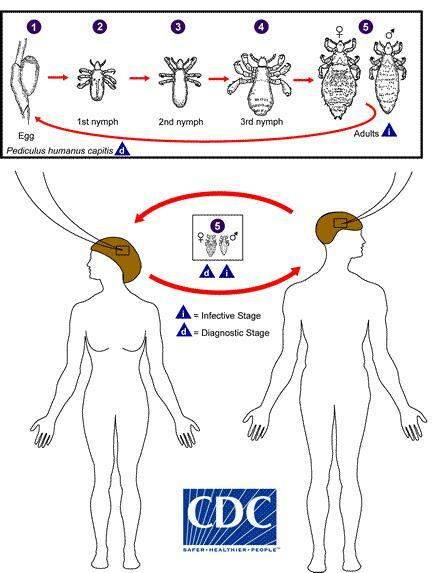 They have a three stage life cycle (egg, nymph and adult), as shown below for head lice. The nymphs molt three times before reaching maturity. Our concern is for three species of human lice, whose common names indicate their preferred feeding site. Head lice (Pediculus humanus capitis) (Figure 1) live on the skin among the hairs on people's head. They glue eggs ("nits") to the base of the hair shaft, frequently behind the ears or on the nape of the neck. Nits hatch in about 5-10 days and the light-colored nymphs begin feeding immediately. Development takes about 18-20 days; adults can live for about one month on their host. Head lice can infest clothing and other items that come in contact with the head (e.g., hats, shirt collars, barrettes, brushes, combs, etc. ), but they do not survive off of a person for more than about 48 hours. Head lice are not known to transmit any disease organisms. However, their feeding activity irritates the scalp, causing intense itching, and a secondary infection may result if the skin is broken by repeatedly scratching the area. The most notable impact of head lice is the personal embarrassment experienced with being identified publicly as having lice (e.g., in a classroom). Children, particularly those of elementary and middle school age, are most likely to get head lice because of their close contact and social interactions with each other (e.g., sharing hats, combs and brushes) creates opportunities for the lice to be spread among them. Children who become infested in school will carry lice home and may infest family members who unknowingly become a source for recurring louse problems in the home. Solving head lice problems is not difficult if everyone cooperates. Parents should notify the school principal or nurse immediately if their child is identified as having head lice. Don't be embarrassed by the problem and hesitate about calling the school. Remember two very important points. First, just because your child has head lice does not necessarily mean that he/she is the source of the problem. Second, and most importantly, if school officials do not take any action because they are unaware of the problem, lice will likely spread to other children in the class. If the problem continues unchecked, eventually even those children who were treated previously become reinfested and they must be subjected to treatment again. Remove nits from hair. Mechanical removal of louse eggs helps reduce the number of lice that might hatch on the scalp. Since children who are declared "nit-free" by a doctor or school nurse can return to class sooner, removing nits has a positive impact on their morale and lessens disruption to their school and social activities. Special combs are provided with the pediculicides and the instructions for their use must be followed explicitly. Be persistent and thorough. Because the eggs are literally cemented to the hair shaft, they are not easily dislodged. Contrary to popular belief, using vinegar in a shampoo or as a rinse is not effective because it does not dissolve the glue that binds the nits to the hair shaft. There are also special non-insecticidal rinses, such as ClearTM Lice Egg Remover, that dissolve the glue binding the eggs to the hair. Nits are more easily removed after shampooing/rinsing, when the hair is still damp. Several combing sessions may be needed to remove all of the nits. Delouse personal items. Although head lice cannot survive for long periods off of people, sanitation helps end the problem more quickly. Items such as brushes and combs should be washed thoroughly in hot water (at least 130o F) for 5-10 minutes. Washable clothing, hats, head bands, bed linen and other personal items should be washed in hot soapy water, then dried in a clothes drier for at least 20-30 minutes. Non-washable clothing can be dry-cleaned, but the expense is hard to justify when a simpler solution would be to isolate theses items for a few days. Vacuuming mattresses, upholstery, and carpeting will pick up stray lice. Although hair with attached lice eggs may fall out and become attached to stuffed animals or similar toys, such items do not serve as reservoirs for the lice. If there is some concern about these items carrying lice, the simplest solution is to vacuum them or (if possible) place them in a clothes dryer set on maximum heat for about 1 hour. Isolating items in a garbage bag for 5-7 days should also eliminate any active/hatching lice. Spraying furniture, carpeting and bedding with an insecticide serves no real purpose other than providing some margin of psychological comfort. Although such sprays kill an occasional stray louse, family members who are already being treated with insecticidal shampoos can be exposed unnecessarily to additional pesticides. We do not recommend spraying insecticides carpeting, furniture or other items. The extent of delousing activities in a school depends largely on the age of the students and the layout of the classroom. As in the home, vacuuming carpeting and/or sleeping mats can help. Mats with vinyl or other non-fabric coverings can be cleaned with hot, soapy water. The same holds true for classroom desks and chairs. Clothing or personal items that students leave in closets, storage areas or desks should be removed and cleaned. Applying insecticides in the classroom is not necessary and it discouraged. School buses should not be a problem but the seats and headrests can always be cleaned with an appropriate cleaner. Body lice (Pediculus humanus corporis) look virtually identical to head lice look identical, but their location on people is a reasonably accurate diagnostic clue. Head lice are found almost exclusively on the scalp, whereas body lice may be found either on the body or clothing. Unlike head lice, body lice attach their eggs to the fibers of undergarments, particularly along inside seams and other areas of close body contact. A female body louse usually deposits 9-10 eggs per day, and a total of 270-300 eggs over her lifetime. The eggs are incubated by the person's body heat and hatch in about one week. Temperatures above 100°F or below 75°F. reduce or completely stop egg hatch. Development time (egg to adult) is about 3-5 weeks. Body lice are most common during the winter months, when people tend to wear layers of clothing, creating a warm, moist environment that is ideal for louse development. An important point to note is that body lice spend most of their life on clothing and crawl onto the host to feed for short periods. Although as many as 1,000 body lice have been removed from heavily infested clothing, ten lice per person is probably more typical. Body louse problems are more likely to occur in situations where the same clothing is worn constantly for several days or weeks. Since body lice can survive away from a person for 24-48 hours, they can survive in clothing that is removed nightly but worn again the following day. Although body lice can transmit certain disease organisms, this problem is generally confined to underdeveloped countries where poor sanitation and overcrowding are major contributing factors. Feeding activity by the lice causes significant skin irritation, swelling and the formation of red welt-like marks. Severe infestations can lead to allergic reactions and skin disorders, such as impetigo and eczema. Treatment for body lice is virtually identical to the procedures for head lice. First, the infested person must be treated with pediculicides (lotions or shampoos). As in the case of head lice, body lice move rapidly from person to person upon brief contact or when clothing is shared. Other family members (or classmates) with whom the person comes in contact should be checked and treated, if necessary. Clothing, bed linen and other personal items that have been used recently must be deloused as outlined in Step #3 for head lice. Vacuuming mattresses, carpets and upholstery will help remove stray lice. Pubic or crab lice (Phthirus pubic) are usually found on the hairs in the pubic areas; however, they can be found among the coarser hairs of the chest, armpits, eyebrows, eyelashes, moustaches, and beards. Unlike body lice, crab lice are dark gray-to-brown in color. The name "crab lice" comes from their flattened, oval crab-like shape. Their second and third pairs of legs have thumb-like projections that aid in grasping the host's hair. Eggs of pubic lice are dark brown and smaller than those of head and body lice. The female lays about 30 eggs during her 3-4 week lifespan, usually on the hairs of the pubic region. Crab lice are more sedentary than body and head lice, and usually pass their entire life cycle in the same area where the eggs were deposited. Crab louse bites produce discrete, round slate-gray to bluish colored swellings on the skin. Proteins in the louse's saliva may cause an allergic reaction and intense itching. As with head lice, secondary bacterial infections may result from constant scratching and breaking the skin. Lice infesting the eyelids can cause severe inflammation and swelling around the eyes. Crab lice are not known to transmit disease organisms, but one survey found that 1⁄3 of the individuals with crab lice also had a sexually transmitted disease. Crab lice are spread primarily through sexual contact. It is possible, but extremely rare, that they could be acquired through contact with infested toilet seats, clothing or bedding. As with other louse problems, successful treatment is based on a combination of sanitation and pediculicides. As with other louse problems, successful treatment is based on a combination of sanitation and pediculicides: Family members who share a bed with the infested person must be examined and treated if necessary. Undergarments and bed linens should be washed in hot water for at least 20 minutes, then dried on a high setting. Louse control products are available either directly at a drugstore or by prescription; however, we strongly recommend that infested persons first seek advice from their personal physician. Because crab lice can only survive off of people for about 24 hours, insecticidal treatments in the home, workplace, school or other areas are neither necessary nor are they recommended. Successful control of louse problems requires communication, cooperation, and a control program that employs sanitation, treatment with pediculicides and delousing of clothing and other personal articles. The most important point to remember is that solving the problem is more important than finding someone to blame for it. Open and frank discussion, quick action, and sensitivity to the embarrassment experienced by infested persons is needed by everyone involved. For additional information, we recommend that you consult the National Pediculosis Association.